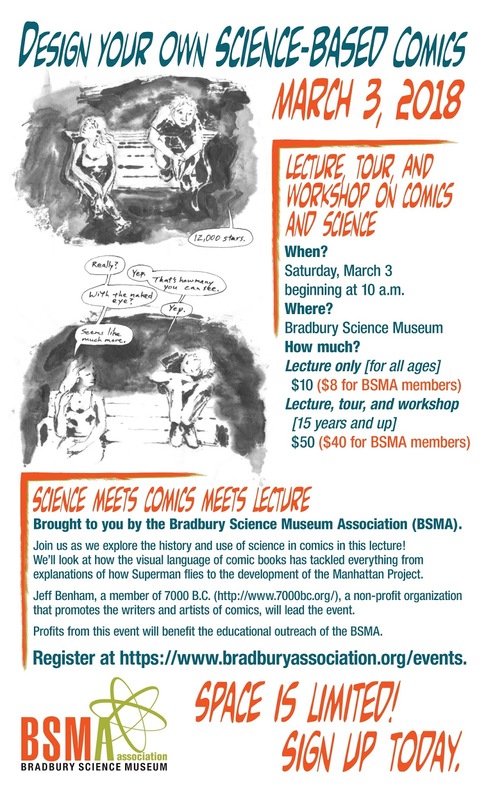 The Bradbury Science Museum Association (BSMA) and 7000 BC explore the history and use of science in comics in a fast-paced, hands-on lecture, tour, and workshop. See how the visual language of comic books has tackled everything from explanations of how Superman flies to the development of the Manhattan Project. Workshop participants will explore the Bradbury in an exclusive tour led by Museum Director Linda Deck, learn techniques of the comics medium, and create science-based comics of their own. Jeff Benham will lead the lecture and workshop. Museum tour from 11:15 to 11:45 a. m.
Visit the events page at BMSA to register. Profits from this event will benefit the educational outreach of the BSMA, which operates as the museum’s non-profit partner and is tax exempt under the IRC 501(c)3.